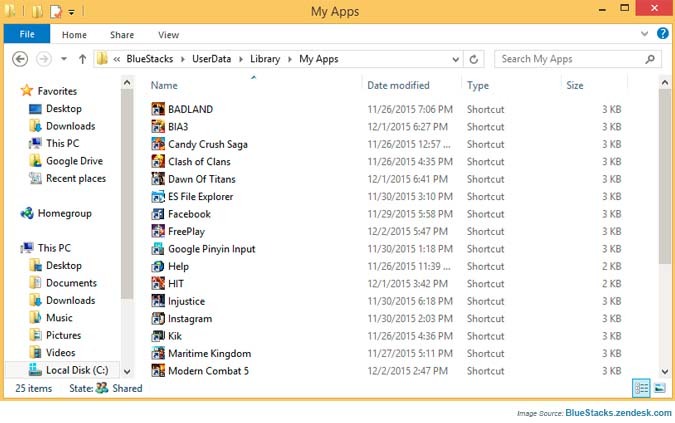 Learn how to create apps shortcuts on your PC for apps on BlueStacks, lets the users access the apps quickly. This feature is of great importance, you just have to click on the app shortcut and it will open quickly. Follow the steps below to create shortcuts for the apps. You have to access the apps location where they are downloaded. The common location of the apps is at C:\ProgramData\BlueStacks\UserData\Library\My Apps. But sometimes if you installed BlueStacks anywhere else, then you have to go to that location. Now make shortcuts of these apps on your desktops, for that right click on it and then select shortcut. Now access these apps via shortcuts, this will let you a quick launch of the app with BlueStacks.